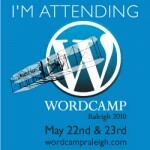 As I anticipated, it’s been GREAT meeting all sorts of neat people here at WordCamp Raleigh (#wcraleigh). The presentation is at Google Docs. Basically the presenter is reciting the google doc … I’m going next door to the sitecast. Lots and lots of talk about SVN (subversion) Server and how to set it up on your development server. Ugh .. this is good and important stuff for us developers, but its like watching grass grow and probably better provided in the form of 3 five-minute how-to videos. Let me check out the SitePoint PodCast. Listening to the author of BuddyPress for Dummies, Lisa Sabin Wilson. Some examples can be found at WordPress.org on their Buddy Press Examples Page. Confirmed guests for the show include Cory Miller, CEO of iThemes, Brian Gardner, CEO of StudioPress, Grant Griffiths, co-founder of Headway Themes, Brandon Eley, Interactive Director at Kelsey Advertising & Design, owner of 2BigFeet and co-author of â€œOnline Marketing Inside Out,â€ Jeff Chandler, host of WordPress Weekly and owner of WordPress Tavern, Gregory Ng, VP, Creative Director at Brooks Bell Interactive and The Frozen Food Master at Freezer Burns, Lisa Sabin-Wilson, author of â€œWordPress for Dummiesâ€ and â€œBuddyPress for Dummies,â€ Aaron Brazell, author of â€œWordPress Bible,â€ Steve Mortiboy, co-organizer of WordCamp Raleigh and Project Manager at Semper Fi Web Design and Michael Torbert, co-organizer of WordCamp Raleigh and Senior WordPress Developer at Semper Fi Web Design. 17 year old Dave Moyer is talking about the ‘woes’ of being a ‘kid’ entrepreneur … and how it shouldn’t be the foundation to one’s marketing push … as ages, like fashion styles, get old. Suggests blueberry power press plugin and/or just use built-in goodies and let FeedBurner do the rest … or audio player plugin. More WordPress postcasters … Jeff Chandler of WordPress Weekly … throwing a hat tip to Moyer’s technical quality. Jeff asserts that since consistency is key … gotta do the podcast when it is convenient to YOU! Gregory Ng gives his reason for being the Frozen Food guru was inspired by Gary Vaynerchuk’s passion for a niche topic … and then dominating it. Up now is Raleigh’s #1 Social Media Guru, Wayne Sutton of TriOutNC.com. Giving advice for those who want to get into the agency space … and why he left it to become an entrepreneur in the social media space. Talking about the Genesis Theme Framework … will be interesting to hear how this compares to Cory Miller of the iTheme Framework who is up next. Nathan mention 18 child themes and a recent security audit … ver 1.2 about to come out … more speed and WordPress 3.0 compatibility. Real Estate Agents will be interested in Genesis themes working in AgentPress.Â Most existing StudioPress themes will be moving to Genesis. PluginBuddy developed out of a need seen in the WordPress community. Basically, for the same reason you’d need a premium theme, you’d want some premium plugins. Businesses like iThemes, wooThemes & StudioPress didn’t happen overnight. Take passion, persistence and readiness – it doesn’t happen overnight. iThemes … most individuals didn’t knock it out of the part … most of us were “born on second” and had help to score on home plate. babies throw up on you, they poop on you, the demand constant attention … yet they are your greatest joy in life … because your passionate about it and you love it (otherwise, get out!-)The business also changes as a baby does … including the WP business having personnel and finance issues like any other business. Book reading about growing the baby. It takes both Passion & Profit”Light yourself on fire, and people will come to watch you burn …“Passion: has to burninate your soul.Profit: gotta make money (talking to a room full of WP people who don’t want to pay for anything)With a staff of 14, with kids and mortgages … if profit is not in the picture … then its a hobby. Be Financially Conservative & Grow OrganicallyBe frugal … don’t get ahead of yourself with fancy stuff … much that loses its value the second you drive it off the lot.Invest in the people instead (put 4 to 6 months of cashflow aside/ahead). …A whole bunch of odds-n-endsA ton of unfun stuff in business – and you need to be ready to do it (HR, Accounting, Financial stuff)Give-aways are a good strategy to initially build your personal themeInnovate or die (yahoo missing google, music industry v. itunes, and dying film/tv industry).Eat books – be a lifelong learner. Read, read and read business books … constantly improve every day.Be flexible and adaptable – things that work today, may not work tomorrow. Perfectionism is NOT obtainable and NOT affordable – make it good enough. Release good products – make them better over time – they need to be in the wild a bit. Be aggressive with your marketing. Experiment and learn. e-Myth by Michael Gerber (why McDondald’s has a consistent user experience everywhere). Find processes that help you work smarter … not harder (not necessarily software). It’s not about project management software – but getting software out the door, and continuously improve it. Treat people right – if you build trust, you build future business. Get away often, take retreats – because you don’t get the 9-5 if you’re running your own busines. You will make mistakes. Don’t be afraid of them, and learn t pick yourself back up and get back in the game. enjoy your work – hating what you do is a red flag for impending failure. If you’re a serial entrepreneur – have an exit strategy. BuddyPress is a plugin that adds a layer of social networking on your site. When running multi-site/multi-user options – users can create their own blogs, blog tracking aggregates who is blogging what in the community.